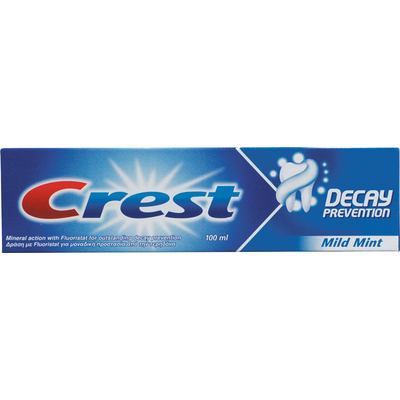 For teeth that gleam with every smile, the Crest Mild Mint Toothpaste 100ml has been clinically proven to aid in the prevention of cavities and the protection of teeth from root to tip. Used daily, the pastes unique floristat fluoride system adds back natural calcium to weak areas in the tooth enamel increasing protection and aiding in the continued health of your mouth. Provided in a 100ml tube and finished with a mild, mint flavour, this refreshing toothpaste is suitable for use by adults and makes the perfect choice for residential work places such as care and nursing homes. Our Personal Hygiene range is fully stocked with everything you'll need to keep your residents in top form including Shampoos, Body Washes and Shaving Foams.